I decided that I needed a bench for my kitchen table. I found one on pottery barn that I absolutely LOVED, but it was expensive and I am cheap (I need my money for fabric). The next best thing, make it myself!!! I started with a bench from Ikea that I had been using in my living room, but no longer had a need for it there. I think I paid $89 originally for this bench. I know there are a lot of tutorials floating around out there, and mine isn't all that different, basically I added decorative nail heads for some flair. But perhaps you'll find my instructions more enlightening or easier to follow! I bought MDF board from Home Depot and had them cut it to the size of my bench. That was simple. They had no problem cutting it for me. Then I went to Joann's to get foam. They don't mind cutting the length, but they sure didn't want to cut the width! And since I didn't have a turkey carver at home, it would have been difficult to cut the foam. They told me that I could use a serrated knife just as easily. Don't fall for that! Make them cut it! They cut mine after I asked for the manager (I was spending a lot of money there!). Be sure to also have a 40% or 50% off coupon, the foam is EXPENSIVE! this piece was $30, with a coupon. My MDF board, foam, and upholstery fabric. I laid the fabric out and then laid the foam on top (positioning it where I wanted it on the fabric). Then I put my MDF board on top of the foam. This was way easier to do than trying to put the fabric on top of the foam and board. I already had these felt squares on it to keep it from scuffing the bench. (This is a felt square with a sticky back that I cut into small pieces). 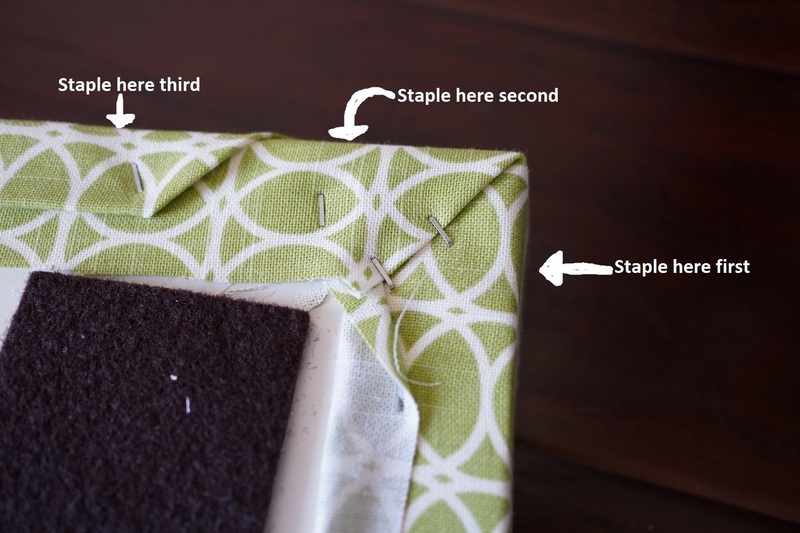 I stapled around the long ends, starting on one end, and pulling the fabric TIGHT! Then I did the opposite side, again pulling tight. For the corners I folded the fabric down like an envelope. Making sure it was pulled really tight. If using a staple gun attached to an air compressor, make sure to be really careful while stapling! I didn't have any accidents, but it still scared me every time! Ta-da! But I'm not quite done yet! I found some decorative nail heads at the local hardware store, 24 for $2! I used a rubber mallet and pounded them in, making sure they were equally placed.